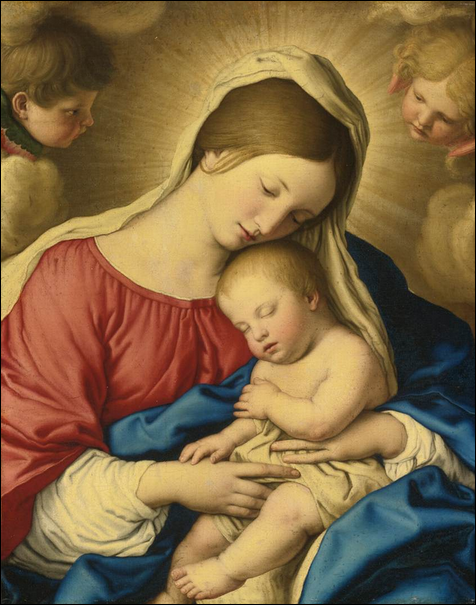 "The Sleep of the Infant Jesus"
1. To the Most Holy Trinity. and evils, be Thou forever praised and adored! suffered may tend to Thy greatest glory. to Thy honor, I may rest in peace. Amen. offended Thee by so many sins. ever to increase in Thy divine love. Amen. 2. To the Blessed Virgin. anguish of heart separated from thy dear Son. all that He has obtained for us by it. Amen. 3. To the Guardian Angel. thee for all thy love and care in guarding me from evil! snares of Satan and from a sudden and unprovided death. bitter Passion and death. Amen. 4. The Good Intention for the Night. no effort of the evil one may lead me into sin. my own poor heart Thy sweetest love. Holy Ghost grant all that I have asked! Amen.